You'll be £12.99 closer to your next £10.00 credit when you purchase He Was My Chief. What's this? As secretary to the Führer throughout the time of the Third Reich, Christa Schroeder was perfectly placed to observe the actions and behaviour of Hitler, along with the most important figures surrounding him. Schroeder's memoir does not fail to deliver fascinating insights: she notes his bourgeois manners, his vehement abstemiousness and his mood swings. Indeed, she was ostracised by Hitler for a number of months after she made the mistake of publicly contradicting him once too often. In addition to her portrayal of Hitler, there are illuminating anecdotes about Hitler's closest colleagues. She recalls, for instance, that the relationship between Martin Bormann and his brother Albert (who was on Hitler's personal staff) was so bad that the two would only communicate with one another via their respective adjutants – even if they were in the same room. There is also light shed on the peculiar personal life and insanity of Reichsminister Walther Darré. Schroeder claims to have known nothing of the horrors of the Nazi regime. There is nothing of the sense of perspective or the mea culpa that one finds in the memoirs of Hitler's other secretary, Traudl Junge – who concluded 'we should have known'. Rather the tone that pervades Schroeder's memoir is one of bitterness. This is, without any doubt, one of the most important primary sources from the pre-war and wartime period. The last unpublished work by a Nazi of any significance. Her observations and obvious devotion to Hitler form part of a greater understanding of one of the darkest periods in history for the German people and as such it a valuable and interesting document. For those who wish to understand the dynamics of Hitlerism - from the early 1930s to the last days of the Fuerher bunker - this is a must read. Christa Schroeder provides a rare, fascinating insight into Hitler and his household. This memoir from Adolf Hitler's personal secretary provides an insider's view to working for the Führer. Christa Schroeder has very little to say on politics, almost nothing on the conduct of the war. Instead she focuses on the personal, describing Hitler's working and eating habits, his relationships with women and staff, and his physical deterioration as the war draws to a close. Schroeder also paints vivid descriptions of the physical workspaces, from the dank, midge-infested bunkers at the front to the majestic setting of Hitler's estate at Obersalzberg. While clearly biased and seemingly unrepentant, Schroeder serves as an important eyewitness to the Nazi regime. view from above or beyond. 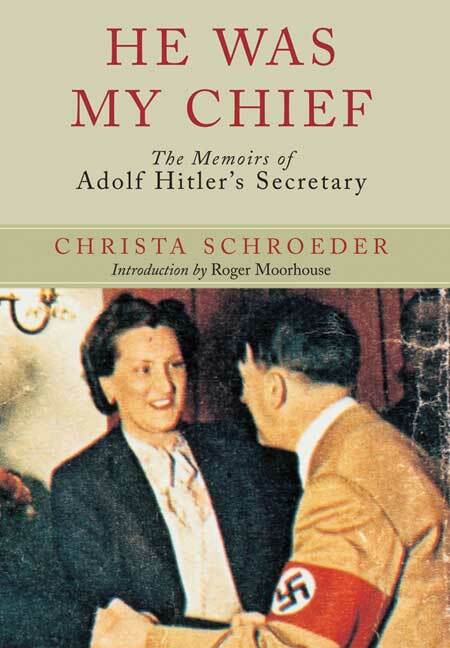 These are the memoirs of one of Hitler's secretaries and no one could be closer to the man than her. She describes all the great events of the Second World War from the perspective of his headquarters, including the invasions of Poland, France and Russia. Intriguing eye-witness material makes the book a fascinating insight into the dictator and his regime. An alternately adoring, clinical, fascinating and creepy take on one of history's most evil men. A rare and fascinating insight into Hitlerâ€™s inner circle. Christa Schroeder's memoir of the 12 years she spent working for the Fuhrer gives a unique insight into his intelligence, temper and his personal quirks. Christa Schroeder was Hitler's personal secretary for twelve years in total. She worked as his secretary until his suicide in April 1945, living at the Wolfsschanze near Rastenburg. Her memoir Er War Mein Chef was first published in 1985, a year after her death in Munich, aged 76.